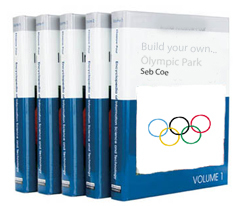 The instruction book for building the Olympics is now complete. And at 10,000 pages, it's three times the length of JK Rowling's entire oeuvre. Unless they've used really big writing. The Olympic authorities have submitted what is said to be 'one of the biggest planning applications in European history. The 15 volume saga details the venues, parks and roads that will make up the site, and how they will change after the games. The project now moves into the next phase, called 'Making the Park 3D'. Oh come on, where's the ambition? We want this to be the best games ever, right? Let's go for a world-beating seven-dimensional Olympics. We won't settle for anything less than a hyperspherical velodrome nested within a tesseract. Whatever happens, the Olympics are going to take a lot of stick over the next few years. And you can rely on Londonist to join in. But, for once, we want to say congratulations to the team on reaching this point. If we'd just submitted 10,000 pages, we'd be very drunk by this point in the evening. What's a few cocktails on the expense account, when you're already a billion pounds over budget?